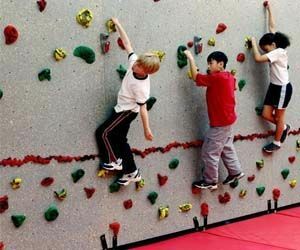 Indoor rock climbing is a fun and economical way to entertain the kids during school the holidays. Whether it’s a climbing wall you’ve hired for home use or visiting a professional indoor rock climbing centre, this is a great way to keep the kids physically active while having fun. Here are five reasons you should encourage your kids to try indoor rock climbing. Being physically fit is so important and maintaining a balanced lifestyle should be integrated into your child’s life from a young age. Living a healthy life not only includes physical activity but also starts in the kitchen. Providing nutritious meals gets them into the habit of living a healthy lifestyle. Eating healthy and exercising regularly will give them a sound mind and body. We cannot expect a child to have a regular exercise routine like we adults go to the gym. Their young minds need something exciting, such as playing a sport. Joining school teams for each sports season is the best way to keep them active and help them make friends outside of their classroom. If your child isn’t really interested in any team sports, that’s perfectly fine! What about rock climbing? This is just as, if not more physically and mentally engaging than other sports. They will build incredible core strength as they have to lift the weight of their body to get to the top and go from left to right. It is both challenging and fun for your child. You as a parent can actually join them too, because rock climbing is such a great activity for all ages. There are plenty of centres around Perth to choose from, find your local centre and get the kids involved today! Check out Rockface based in Northbridge and open every day of the week. Climbing requires a high level of hand-eye coordination. Your child will be using both their mind and body to complete the activity. It will help aid their motor skill development. Tasks that require motor skills are those which involve the whole body and your child will begin to start climbing things such as furniture from the age of two years old. They have to use their eyes to find the next piece of rock to hold to continue going upwards. This activity helps them to improve their own depth perception and judging distances of objects from their body. Not only are they improving their physical strength, but they are improving their mind as well. Rock climbing is a fun and cheap way to entertain the kids during school holidays. There are often Scoopons or discounted deals at many rock climbing centres around Perth. We have a link here for City Summit in Malaga, it’s $20 for 2 people! Grab this deal ASAP and get your kids away from the television screen. We know how involved kids are with their electrical devices. Start them off slowly with indoor rock climbing and then gradually move onto outdoor sports. It will get them off the sofa and into action, getting their blood flowing. Rock climbing encourages them to believe in themselves and set goals to get to the top. Everyone is afraid of something. If your child is not comfortable with heights there is nothing wrong with that. Indoor rock climbing could be a great way to challenge them and encourage them to get over their fear. It will also help them develop their own confidence because they have to believe in their own skills to reach the top. In conjunction with developing their motor skills and hand-eye coordination, they will have to use their mind to perceive which rock would benefit them the most to climb higher to get to the top. Climbing engages all the senses and is a valuable learning experience. If you like the idea of rock climbing and would like to host your own party, consider hiring a portable wall. Yes, this is possible. Monsterball Amusements & Hire have two types of portable climbing walls. We have a huge 9m high inflatable wall and another mechanical 9m high wall called ‘Spider Mountain’. While the inflatable wall is suitable for children up to 12 years old, the Spider Tower can be used by children and adults alike. Both equally fun to try, but if you are looking for a great added feature, the Spider Mountain unit comes with bungee trampolines too. You can challenge all the muscles in your body (yes you will wake up very sore the next day), it will be worth it though. Get in touch with us today or call 9335 5109 to find out more.